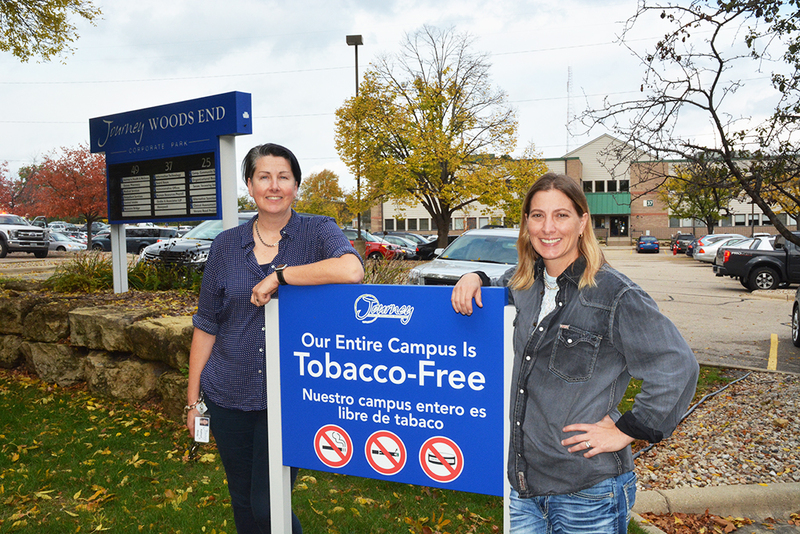 Journey Mental Health Center (JMHC) received a Mac Award for its efforts to make its headquarters in Madison a tobacco-free and vape-free campus starting September 15, 2017. The award, named for David “Mac” Macmaster, co-founder and managing consultant of the Wisconsin Nicotine Treatment Integration Project (WiNTiP), is presented to honor a health-care organization that helps its behavioral health patients live tobacco free. WiNTiP is a collaboration between the Wisconsin Department of Health Services and UW-CTRI. JMHC provides comprehensive emergency, clinic-based, and community-based behavioral health care to approximately 12,000 people in Dane and Columbia County. Many of these services are provided at its campus headquarters, consisting of three buildings around a large common-surface parking lot. There are additional community locations for Assertive Community Treatment Programs, Columbia County CCS and CSP, East Side location for CCS, PROPS and Clinic Based Services, Emergency Services Unit, Bayside/Recovery House and Yahara House. WiNTiP Co-founder and Committee Member Dr. Eric Heiligenstein was a psychiatrist at Journey. He trained Journey staff to learn how to help patients quit. He also helped secure grant funding to pay for initial nicotine-replacement medications for staff and clients. He said the transition to a tobacco-free campus was smooth, and the staff were on board. Heiligenstein was a member of a committee Journey established to go tobacco-free, led by a champion for the cause, Saima Chauhan, Journey substance abuse/mental health manager-clinic based services manager. She had led a similar project to go tobacco-free as a clinical director for a residential drug and alcohol program for adults in Arkansas, and brought lessons learned to Journey in Wisconsin. Before the campus went tobacco-free, the committee began communicating with staff a year in advance, and intensely so four months before going tobacco free. Journey informed clients three months ahead. Thus, when the first day of being tobacco-free arrived, it was old news. Staff were given guidance about how to gently remind people of the change. A year later, tobacco-free signs remain ubiquitous. Some clients still smoke, and Journey staff are there to help them as part of their overall recovery. One challenge is balancing tobacco treatment with other clinical needs. “Our supervisors meet with their teams and say, ‘Don’t forget about Tobacco Use Disorder: Mild, Moderate, Severe,’” Chauhan said. Supporting tobacco-free recovery also sets Journey up in better position to receive grants from SAMHSA and other funders. Most importantly, the tobacco-free campus helps create an environment where clients can recover. 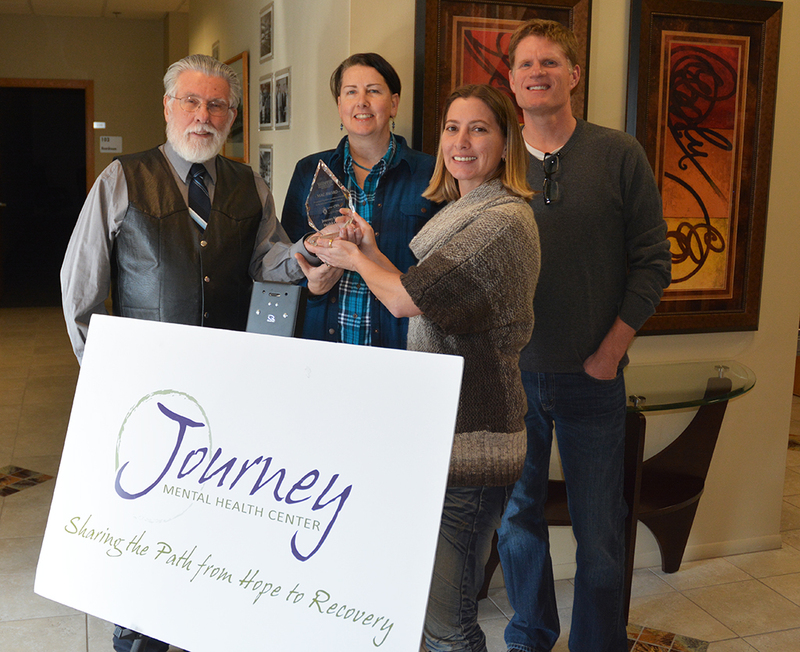 From left: WiNTiP Managing Consultant David “Mac” Macmaster presents the award named in his honor to Kathryn Rindy, Saima Chauhan and Michael Wiltse of Journey Mental Health.